I think I will generally stick to talking about the football, although the uncertainty hanging over the club was bound to have some effect on the performance. Once again PNE played some decent football in the central areas of the field but at the back we made some schoolboy mistakes and up front we were powder-puff to say the least. 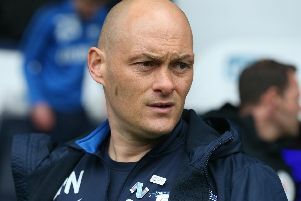 I have said it several times recently – Preston desperately lack a leader on the pitch and nowhere was it more obvious than at The Hawthorns on Saturday. Add to this a poor run of form going into the game and a severe case of mental tiredness throughout the squad and it not very difficult to find reasons why North End have conceded nine goals in the last four games, whilst only scoring two. The manager made three changes from the starting XI beaten by Leeds on Tuesday with Ledson, Gallagher and Stockley coming in for Pearson, Maguire and Robinson. The game was quite even for 25 minutes or so but the Baggies always looked the more likely with much more quality on the ball, even though they had lost the last two games themselves. Just before the half-hour we were one down when Brunt swung in a long ball that should have been dealt with, only for Gayle to finish with aplomb. It wasn’t long before Josh Earl misdirected a pass in the North End half with the outcome being another goal for Gayle, with Preston all over the place. When Rodriguez made it three after a through-ball, the game was over as a contest and North End already looked a well beaten side. To be fair to the boys we came out in the second half and put in a much better performance than the first, although it could hardly have been any worse. Still the lack of firepower up front proved to be North End’s biggest weakness even though the defence had conceded three goals. We did have an excellent chance just on the hour mark when Robinson just failed to reach a ball at the back post from Nmecha as North End tried to up attacking threat. However with 20 minutes to go things got worse as a Brunt corner finally found Gayle who prodded home for his hat-trick and that was that. North End did get one back in the first of two added minutes when Robinson controlled the ball in the box and fired home a deserved late consolation past Sam Johnstone in the Albion goal. So it is Championship football for North End again next season after what has been a very topsy-turvy campaign this time around. The boys need to gather their thoughts for the last four games because there is still plenty to play for in terms of league position and some kudos against our local rivals. One battle we did win yesterday was off the field, where the travelling Gentry of 2,752 gave the boys some absolutely fantastic support and out-sung the home support for all of the game. A disappointing Gentry Day from a results perspective but everyone looked like they had a decent day out, in spite of the goings on both on and off the field.